Parsing with Rhino is quite simple and well documented. AstNode class has methods like getSymbols and getSymbolTable which I presumed would give me all variables and functions declared in the code. However these methods returned only functions and not variables declared. So I had to traverse the tree and get all symbols. I thought I would use visit method of AstRoot to process all nodes. However the above code threw ClassCastException exception in the visit method of ScriptNode class. So finally I decided to traverse the AST from root and process each node. That is when I realized Rhino created AST differently from that AST I had worked with earlier. The AST I had worked with created nodes with their children as array of nodes. If you start with the root and visit each child, you are sure to traverse the entire tree and hence the code. However Rhino does not create nodes with array of child nodes. 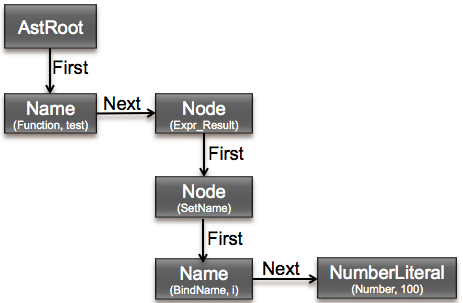 Each node has methods to access the first node and then you can traverse remaining child nodes by accessing ‘next’ member. So instead of an array, it creates linked list of child nodes, which is not such a big problem. However a few things surprised me when I traversed the tree. Call next on the parent node and repeat the loop. If you want to visit function body, you will have to call getFunctions (or getFunctionNode) method of ScriptNode. Both AstNode and FunctionNode are of type ScriptNode. If you traverse the node as I described above (children first and then next node), you are not guaranteed to visit all AST nodes. As you can see, only function Name node is in the tree. AstRoot has two children – Name (Function) and Node (Expr_Result). Expr_Result node has one child – Node (setName). SetName has two children- Name (BindName) and NumberLiteral. This tree represents the entire code, except body of the function test. As mentioned earlier, you can get body of the function by calling getFunctionNode on AstRoot. Now, if you inspect Name (BindName) node, you will see that it’s parent is Assignment node. Assignment has left node as Name(BindName) and right node as NumberLiteral. However Assignment is not part of the tree if you traverse it as described above. Hello. Nice article. I am currently struggling with Rhino AST. You state that it is quite well documented, I have not found much in the way of documentation apart from the JavaDocs that have some gaps. Do you have a link to some useful documentation? Thanks again for the helpful article. When I said that parsing with Rhino was well documented, I was talking about documentation for using parser APIs, not how AST was structured. However I can’t seem to find where I saw the documentation about using Parser APIs now. I am sure I saw it before. I might have also looked at test cases under testsrc/org folder, when you download Rhino. I haven’t done something like this before, but one possible solution could be that after you parse JS code, get all FunctionNode. You can get the start offset of each function by calling getAbsolutePosition method. The end offset could be startOffset + node.getText().length(). Once you know start and end positions, then insert wrapper code at those positions in the source file. What do you mean by capturing every single word in JS script? With the script you posted, you will be able to capture all functions and variables. Can you give example of what you are not able to capture with your code? In this case, from the previous code I will be able to extract [ emptyfun, methods, length, length1, console, window, method ] but I will not be able to extract words like [ function, assert, clear, etc]. Even though I have the script I cant separate words based on when a space character occurs (will not work in case of obfuscated script). //find constant from Token.java and handle the case if you want. thank you sir…your method printnode() in above comment is quite useful for me. then switch goes to default case and print final int value like 145. i want to print var name. and other problem is that if my script contains function code then various parse exception occurs. then please give me hint for how to reach eval() while parsing script. The code snippet I posted in one of the comment for just an example of how to process nodes. I did not handle all the cases. To evaluate function calls, like eval, you can either check parent of node in Token.NAME case (in case of function call the parent would be of type FunctionCall) or handle a new case Token.CALL. Use debugger to see details of each node. Also refer to source of Token class of Mozilla to know what node type constants mean. Your article is very helpful and thank you for writing such article. Where can I get all types of AST nodes? I have searched but no luck. Could you please help me how can I check the if below regular expression is present in my JS file after I have parsed it using AST?